With the winter just around the corner many parents are not looking forward to having high energy kids mostly trapped in the house for several months. 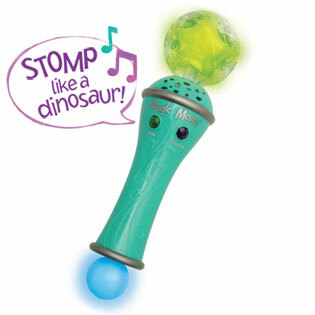 Welcome, Magic Moves Electronic Wand, which is all about moving in fun and exciting ways. It has ninety physical commands that are going to be very exciting for young children. Who wouldn’t want to stomp like an elephant, or swoop like an owl, among dozens of others. With some fantastic music, and a twinkling light show, this is a great way for your kids to move, exercise and boost their imagination and listening skills.This fun toy is available from Educational Insights. Educational Insights is also hosting a contest for a quest to get 50,000 Facebook fans . Every 1,000 fans – they will choose one lucky winner to win a prize pack worth $500! When they hit 50,000 fans, they will reward ALL of our fans! As well, they are giving away one of the above Magic Moves Electronic Wands to one lucky winner from Canada or the USA. A random draw will be held by Random.org on October 31, 2012 from all entries received. If no Facebook, leave a comment for them here.With your email. I like Educational Insights on Facebook - Kerry Gibbs H.
I follow you on Google friends as nightowl. I'm not on facebook but really like the products from Educational Insights. I added you to my Google+ circle! I joined you on Google Friends!